Sasquatch! Festival IS BACK – and that means that you can grab your early bird passes as the huge range of acts plan to take to the stage for the weekend! Washington's incredible music scene will be brought to life – Indie rock band and singer-songwriters, as well as alternative rock, hip hop, EDM, and comedy acts…. come and enjoy all of this and more and soak up the festival vibes! Day passes are now available to book – Here's day 1 at Gorge Amphitheatre on Friday 25th May 2018! Kick start your Summer ahead of everyone else! 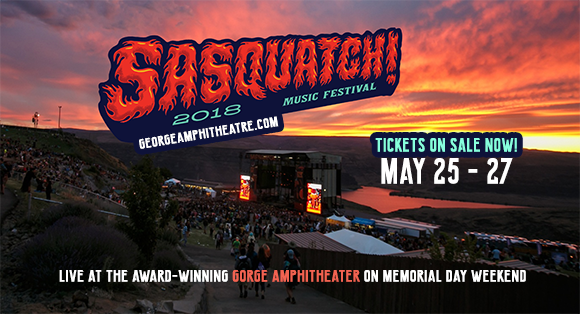 As the nine time winner of Pollstar Magazine's Best Outdoor Music Venue – The Gorge Amphitheatre is the perfect place for a music festival so it's no wonder that time and time again the Sasquatch! Festival has been held in its grounds. Since 2002, music fans have gathered fan and wide for the unforgettable weekend of nothing but the best selection around! The Gorge Amphitheatre is situated Columbia River located at 754 Silica Rd, George, Washington. – There's no age restriction – all ages are welcome! – For parking on site, it's FREE but please note that overnight parking is not allowed, lots will open from 9AM Friday morning (May 25th). – For ticket collection, Box office opens at Noon on Thurs. May 24; 11AM on Fri. May 25 – Sun. May 27, please bring Photo ID if you wish to collect at the point. – Festival happens rain or shine, please be prepared, so that you can dance no matter what the weather!